The Insider's Guide to UC | Tūpono - Page 522 of 649 - Where Canterbury students share their experiences. Thank you to the 40 Class Reps who volunteered for the UC Open Day last week! It was good to see so many students putting their hands up to help out. If you want to become a Class Rep and be able to get involved in other opportunities around the University, make sure you sign up to be a Rep for your class in Semester 2! Class Reps are the go-between for students and lecturers to help resolve low level issues. They are also essential to help ensure the class is running smoothly for future students. To be rewarded for your efforts you can get a certificate for your CV and be in to win one of ten $50 UCSA café vouchers! Who doesn’t love a good mascot? They can unite a community, bring luck, and represent the common goals of the team or organisation it represents! Do you want to be part of history? Then get designing! UC Sport is running a design competition for a new mascot and all students are invited to submit their ideas. The design for the mascot should unite all sport clubs, teams and the wider UC sporting community under one banner. It should define the UC brand and be identifiable by internal and external communities as representing UC. The mascot will be displayed in UC sport publications, advertisements, the website, clothing, future facilities and more. It will be actively involved in the promotion of UC Sport events, as well as UC events on campus. The mascot will need to be positively perceived by children and adults, and embody the values and reflect the culture of UC and its students. The mascot should reflect who we are as a university and the design will need to incorporate UC’s colours of red, grey and black. UC Sport clubs and their teams will continue to be known by their own nicknames. The competition is open from 15 July, and runs through to 15 August. If you think you have the winning idea then make sure you enter the competition and help create history! For more details on the competition check out the UC Sport Design a Mascot Competition a Facebook event. 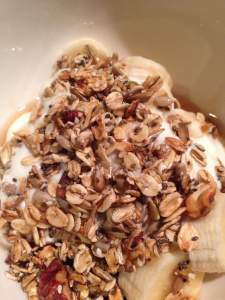 I made my own muesli this week just as a bit of an experiment. This is what I came up with….